Having sold the Saracen brand to Madison in October 2008, few questions were asked about what was next for the Stanforth brothers, who since the birth of mountain biking had spent two decades selling huge volumes of mainly off-road bicycles which were widely carried among the UK trade. Throughout the Saracen heydey, over on million bikes were sold, largely due to the explosion in popularity off-road cycling was enjoying. It is now the brother’s goal to turn trendy looking electric bikes into a sales winner. Based on the aesthetics alone, EBCO has already gathered interest from the boss of a large pizza firm whose curiosity about their use for deliveries was sparked by chance shortly after the first samples hit the UK. It’s interesting to note that the Stanforth’s believe the electric bike market is very much in the same position mountain biking was in the mid-eighties – in its infancy and with potential to achieve huge growth in a matter of years. So could the Stanforth’s be onto a winner yet again? "We’ve been watching the market for around two years with great interest," said Paul Stanforth. "Having spent the past eight months designing, speaking to our audience and sourcing the right manufacturer, we’re now in a position to have EBCO’s first bike line available by the end of August." Crucial to the brand’s philosophy is a no cut-corners approach to the manufacture of electric bikes, something which the market has been dogged with to date. "Our bikes won’t retail much below the £1,000 mark for a good quality starter model, meaning there will be an option qualifying for the Cycle to Work scheme. 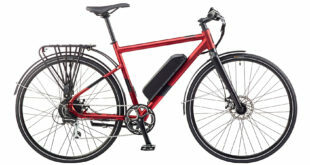 Primarily the focus of EBCO is to produce only top-end, highly reliable e-bikes requiring only a low level of maintenance and minimal upkeep. It is our goal to be the leading brand in terms of technology and performance, something we feel achievable utilising TransX’s power support technology." With battery technology steadily advancing, Stanforth feels the market may gradually become more accessible as greater volumes go through production. "With battery technology advancing, largely due to the need for longer lasting laptops and mobiles, we’re starting to see performance of e-bikes greatly improve. The range of our models per charge is up to 44 miles, which is quite a significant distance. With greater volumes of lithium batteries in production, perhaps, in time, prices will decline slightly." Lithium polymer batteries, taking around five hours for a full charge, are utilised on each model, while 250-watt motors, developed by TransX provide the power assistance. Carrying Shimano spec throughout, the six-bike line up will feature three models in men’s and women’s versions ranging between £999 to £1,599. Other perks include puncture resistant, reflective sidewall Kenda tyres, as well as intelligent ‘torque’ monitors, which ensure the appropriate power assistance is supplied on each of the bikes’ three speed settings. EBCO will distribute its entire range through a newly created e-commerce website, though is looking to appoint a number of strategic retail partners throughout the UK. A dedicated Warwickshire showroom will also open toward the end of August, which will also house the warranty and service centre.